Alkasim Abdulkadir, Abuja: The Presidential Committee on the North East Initiative (PCNI) remains committed to fostering synergy among all the actors currently engaged in recovery efforts in the North East. The PCNI Vice Chairman, Mr Tijjani Tumsah stated this on September 18, 2018 during his opening remarks at the Joint Technical Session of all actors involved in the implementation of the Inclusive Basic Service Delivery and Livelihood Empowerment Integrated Programme (IBSIP) funded by the African Development Bank (AfDB). 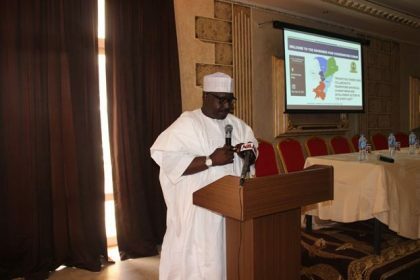 He stressed that the scale of the challenge in the North East calls for an unprecedented range of collaboration among all stakeholders and partners to achieve maximal outcomes. He also said that as more and more people return to their homes, the provision of essential services and job creation in safe locations will play a great role in ensuring that the returns are sustainable, and that people can get the basic tools they need to begin to rebuild their lives. We also aim to strengthen the institutions providing services for long term sustainability. This plan does not focus on building the physical infrastructure alone, the human capacity will be supported and strengthened. The IBSIP is a vast multisectoral project that cuts across civil works, and essential social services, such as education, health care, nutrition, water, sanitation and hygiene, and economic recovery through skill acquisition, empowerment and market recovery programmes; provision of vital equipment, and livelihood support for vulnerable people. The AfDB is investing roughly $250 million in the effort to activate critical impact areas of recovery in the North East identified in the Buhari Plan. These selected components of the Buhari Plan will be the lynchpins of the AfDB’s investments in the rehabilitation and reconstruction of the troubled region. The technical session brought together key stakeholders to share lessons learned from implementation of projects of similar scale, to identify and chart way the forward on any challenges faced in preparing for implementation and improve the stakeholders’ collective understanding of the requirements for successful implementation of the programme.